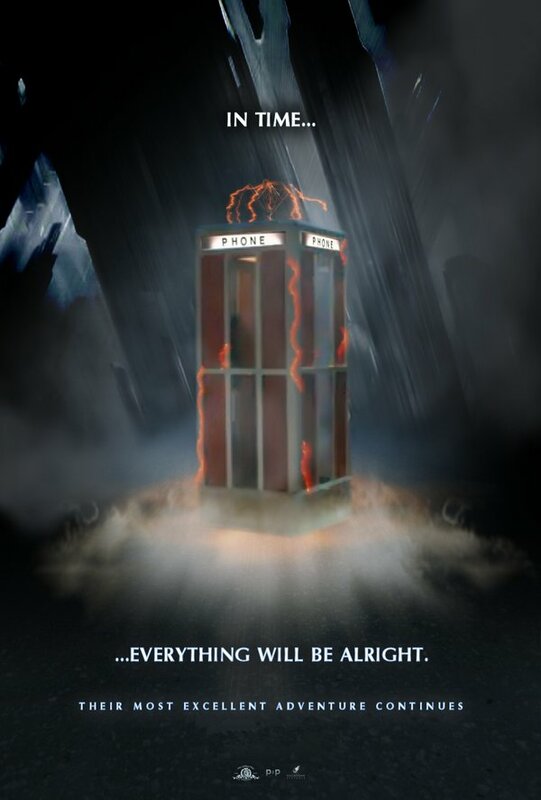 Bill and Ted 3 is in the works. FOR REAL! Well, at least that’s what recent articles have stated. The plot focus on Bill and Ted now, 40 something dudes who still haven’t written the song that will “save the world” (you might recall this little piece of information from Bill and Ted’s Excellent Adventure when Rufus lets them know they save the world/create peace with their music). This is a lot of pressure and I can understand why they haven’t written it yet because what if they fail. I can’t wait for this movie, though it seems like it may still be a while before it graces our screens. But in the meantime here’s a little poster teaser. I’m sorry it’s been a while since we’ve seen each other. I’ve been busy with things and I know you have too. We probably needed space but I couldn’t help it. The restating order can only work for so long and I couldn’t help it but I needed to see your face and breath your air. Sorry about the window. Yeah. So, I might have broke into your house in the middle of the night. And sure, you thought I was a robber but you know as well as I do that we are meant to be. Yes, to others this sounds like crazy talk but I’m crazy, stupid, in love with you and can’t help it. Big romantic gestures are what you taught me. Like in A Walk in the Clouds you were fake married to the pregnant lady just so her dad wouldn’t be mad at her for boning out of wed lock. And let’s not forget about The Lake House. I know we would be able to find each other even if we were 2 years apart in the future. We could defy physics and reality because that’s the power of love and I know ours is strong, even if you don’t know it yet. So, as I sit here in your house, waiting to show you how much care. I love you Keanu and we are meant to be. Keanu woke up to a woman, creepily sitting in his living room as 4 am and he handled it like a pro, calming talking to her as he called the police. I will have to admit when I first heard about Keanu’s movie John Wick I was not impressed. A former hit man getting back into “the game”. Yawn! But when I saw the recent trailer my tune has definitely changed. Not only is he a reluctant returning hit man but he’s one who definitely wouldn’t want to mess with because he’s got a cause to get back into the game. Just watch. No one kills an adorable puppy with out consequences. And to top it off it the puppy was a gift from his dead wife! No wonder he’s pissed and ready to spill some blood. 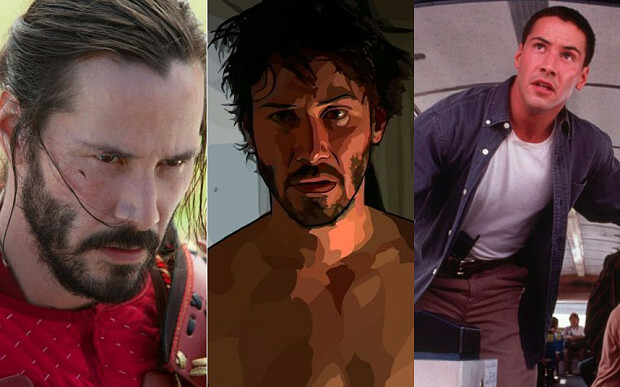 Not only is Keanu upping his acting game but he’s also exploring the ever popular anti-hero/hero character. Sure John Wick has probably has done some wrong in his life and gone and changed his ways but when pushed you better watch out. Also Poor Theon Greyjoy (Alfie Allen ) will you never learn not to piss off the wrong people. Rumored has it that it’s a heavily violent/bloody movie which I’m sensing a Drive-esque feel. I know I’m ready for some bloody revenge Keanu time. Are you? The movie comes out October 24th and I’m a gonna be ready, blood and all! Mr. Reeves and blockbuster director Roland Emmerich are set to work on a sci-fi, action series called New Angeles. The show sounds perfect for them both. One being a Veteran actor of all things sci-fi and the other writing for films like Independence Day and The Day After Tomorrow. So, what could be better? I’m excited to see this collaboration and am thrilled there’s more Keanu to come in all of our futures, on the big screen and small. Get ready 2014/2015! It’s gonna be the Year of Keanu!!!!! I bet you didn’t know Keanu wrote a book of poetry. Yeah. You didn’t, did you? 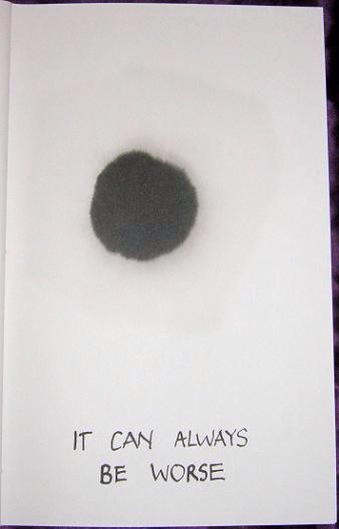 The satirical poem is accompanied by beautiful ink blot paintings, stained by the tears of Keanu. 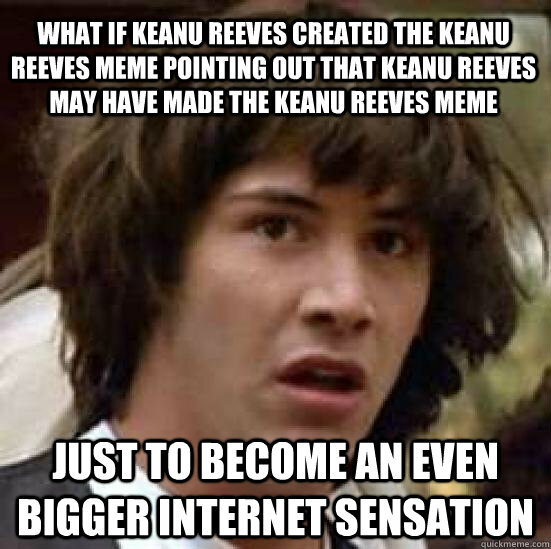 Well, not really but in light of “Sad Keanu” one could only believe that to be true. 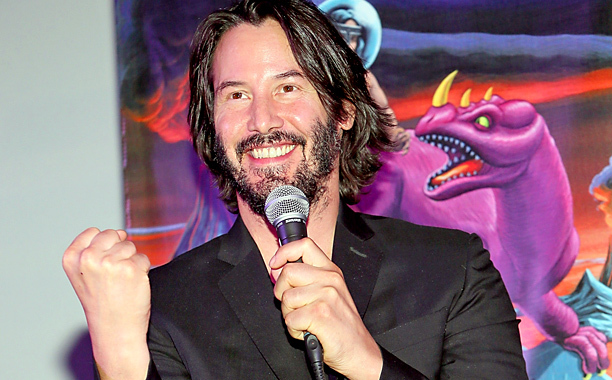 But Keanu is clearly happy about this new venture to writing and I’m excited he did it. Not a lot of actors, or people for that matter, branch out to do something completely different. So, bravo! 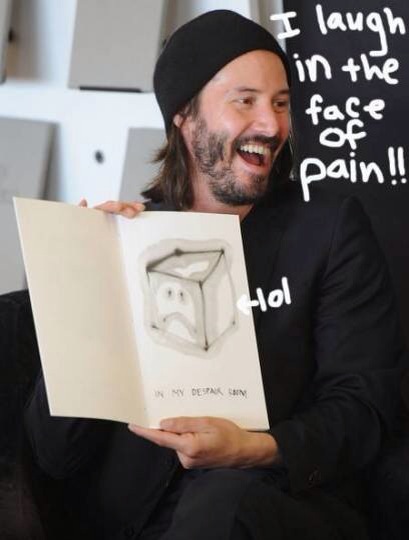 The book has a wonderful lightness to it and shows that Keanu can laugh at himself and not take things to seriously because we all know one thing for sure… That it could always be worse. Since a lot of people take the time to celebrate their Birthdays all week, why not do that with Keanu and his work. Why not grow out your hair and catch the end of summer and watch Point Break? Don’t fight this feeling and just relax and enjoy your weekend with Keanu because you know deep down inside, it’s worth it. Keanu is an actor with many roles under his belt ranging from “The One” to an Orthodontist who’s obsessed with wolves. But there’s one role that he’s played, maybe, too well: the angst ridden teen. Nothing compares to his sweet, naive, absent minded, “stoner” character Tod Higgins from the Ron Howard’s 1989 film Parenthood. There’s some truth and pain in that monologue, probably stemming from his real life experience with his own father not being around. Keanu has more depth then people think. Sometimes you just have to look a little deeper and beyond the “vacant stare” because you might see a beauty and innocence you’ve never noticed. Today is a magical day. It is the day that Mr. Reeves graced the world with his presence. The day that has lead to many great ones that, we as viewers, where able to experience. We laughed, we cried, we felt the Sadness Keanu experienced that day on the bench. Where would we be with out you? I know a lot of people out there don’t feel the same way about Keanu and I’ve known the feeling but it’s just like in The Matrix, you either take red pill and see the truth about him being a great actor/person or you stay in a fantasy world with the blue. It’s your choice but I’m just trying to open your eyes to his greatness. I’m not the only one who feels this way and today on his 50th Birthday they’ve broken down his diverse acting roles and everything he’s done and where’s he’s been from the good to, well, not so good. Keanu, Thank you for everything you’ve done and….